Thanks for your amazing research so far. 10455: Individual scans, not yet merged. 10466: Individual scans, not yet merged. After several months of hard work, this project comes to a close. I'd like to thank everybody for their help and insight. All of the 10 prints have been scanned and can be found on this archival website. Scan Resolution: Between 300 and 800 DPI, depends on print sharpness. File size of individual frames varies from 17 to 125MB. File size of merges varies from 124mb to 600mb. Each print is scanned in 6 sections, making sure there is ample overlap between the scans. Individual scans provided as AS14-80-10###-C#-I#-F#, merged files uploaded with 'merge-C#-I#' suffix. C1I1= Colour fade/cast correction enabled. ICE Infrared Spot/dust removal enabled set to light. I2 = set to medium. Highlight / dark values enhancement for greater contrast, usually very conservative to not blow highlights/dark values. C0I0 / RAW = Colour fade/cast correction disabled. ICE Infrared Spot/dust removal disabled. Unprocessed scan. F## = frame number of set or single image scanned in multiple sections. 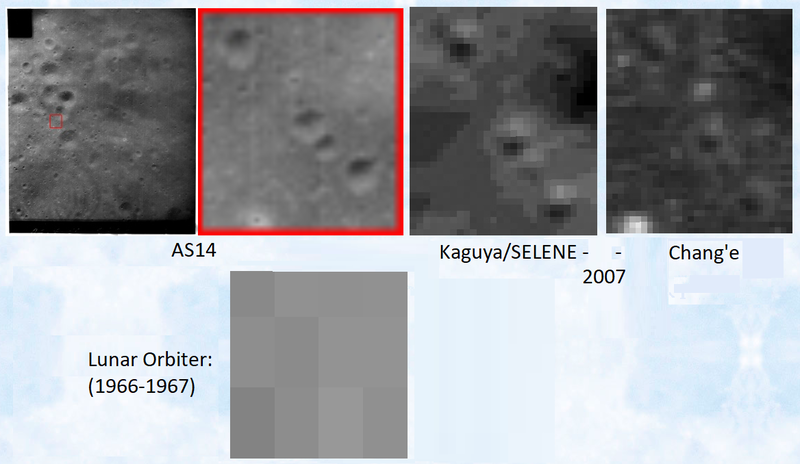 Paul will continue to look at the files in closer detail and compare them to other space missions to the moon, as seen in my previous posts. New developments will be posted here. I am always searching for more of these photos, so if you know any please notify me, so I can try and get it online. If you are interested in having one of these prints, send me a PM. Yesterday I received all AS14-79 and AS14-80 photos from the NSSDCA. Looks like a film copy 'scanned' with a Nikon d750 and 60mm micro nikkor. The 25mb TIFF files are problematic to open, it seems that in addition to the full resolution (6004 * 4002) photo there is a preview and thumbnail view in the file. So there are 3 photos in 1 file. Its only correctly opened with software that understands Nikon RAW. I will convert the files to something common for publication. Unfortinately 'old style jpg' compression is used in the files, so when you zoom in you see JPG compression blocks. I have asked if the NSSDCA can supply NIKON. NEF files without compression. I will keep this topic updated. Disclaimer: I and Paul are not from NASA or endorsed by them. We are doing this in our own free time. This archive contains 251 photos taken on Apollo 14 by a modified Hycon KA-7A camera. These magazines were designated as AS14-79 and AS14-80. I would like to thank the NSSDCA for scanning and providing magazine AS14-79 and AS14-80. I would like to thank Paul for processing the NSSDCA .TIFF files. These photos were acquired by requesting NSSDCA dataset PSPG-00256. A film or digital copy of AS14-79 and AS14-80 was requested. The NSSDCA scanned a film for this request and several months later the resultant digital dataset was provided. Each file is 23 MB and has a resolution of 6016*4016 pixels. The NSSDCA provided TIFF files appear to be NIKON D750 raw files, which can only be correctly opened with special software. Paul was kind enough to batch-process all raw files. Each file was put through a DNG converted, Photoshop will then allow it to be imported normally. This caused the images to turn brown, which was corrected by turning them grayscale. I am trying to locate the Mag 79 files on the lunar surface but it's proving tricky! This is a montage of all the images (I've angled to roughly match the orbital inclination). If they are at the same scale as the Mag 80 files it covers a distance of around 20 km or so, but there is something about the shading that suggest it is not at maximum zoom (I admit I'm going on gut feeling there more than anything). The transcript shows that Roosa tested Mag 79 after Mag 80 failed, and after discussing it with Houston. He reports his experience not long after AOS on the next rev. This is really good stuff from you both, I do so hope you have informed AWE130 that his so called "sole" archive has been superseded? I finally tracked the location of the Mag 79 images. 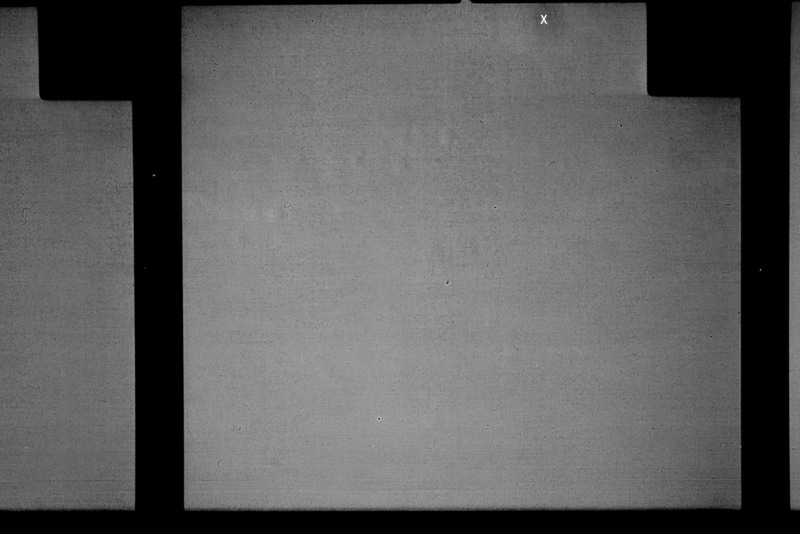 I did not take the LTC photo target 16; I figured that Gordon had implied that it might be a waste of film to shoot them this way; I thought maybe we could get it fixed, we could save the film. I did shoot the landing because I figured, even if it is working - that one we wouldn't have another chance at. And I fired 39 frames off of magazine B [the transcript refers to 'B' a couple of times, I believe it's an error] on the landing per the pad. I don't know whether it will turn out or not, because it - it clanked and fluttered the whole time. and with the quality of the images could have captured the LM immediately after touchdown, or possibly during the landing itself! That said it is not as closely zoomed in as the earlier sessions - the area covered here is 150 km long by 35 km wide, much more than with the same number of frames in Mag 80. As he also tried some other tests of the Hycon there may still be other images available from that magazine somewhere. I can recommend the Microsoft ICE 2.0 stitching software. 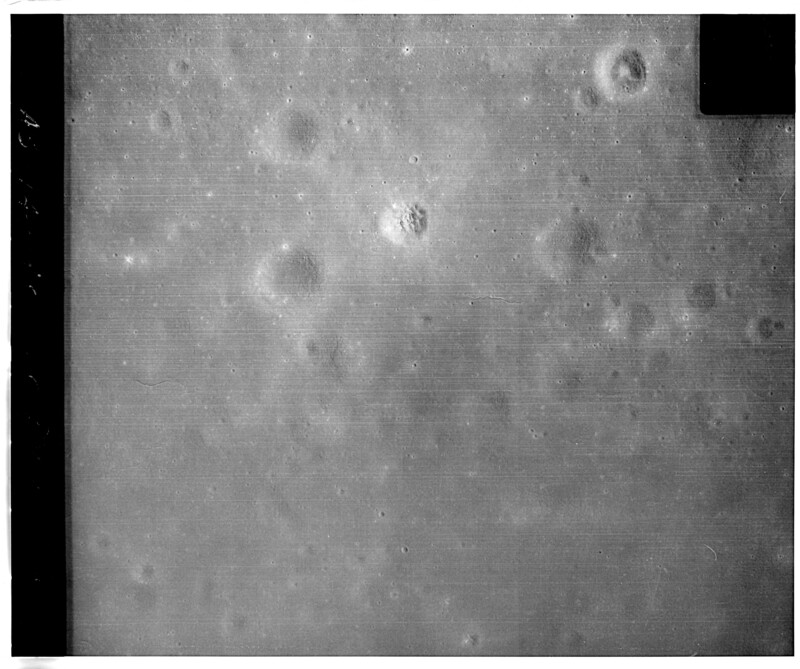 it was able to seamlessly automatically stitch 20-some Apollo Metric Mapping Camera pictures. It also automatically corrects for viewing angle, and path of the photographer. It tries best to even out the lighting differences between AMPC frames. I tried stitching the Hycon photos, but it gets confused by the black clock and framing spaces. After removing the borders it worked flawlessly and takes just a few minutes with full-res PNG files. I recommend converting tiff files to PNG because it drastically reduces processing time and hardware requirements. I know you have made some panorama's from Apollo live TV footage, the ICE 2.0 software can also create panorama images from video, might be worth a shot. if not, I am sure it can merge them when screenshotted. Positions of quite a few can only be regarded as approximate given the lack of detail in many parts of Google Moon. While the Metric Mapping Camera layer is available, switching between that and Google showed that there are positional differences in some areas. I opted for consistency and used LRO screenshots aligned with Google's base layer to plot them where the base layer itself is poor. The sharp-eyed amongst you will notice that I have shifted the position of the final few low resolution images as a result of this more accurate plotting. I did notice that there are two files available in the original low resolution photography report that haven't been supplied, AS14-80-10504 and AS14-80-10561. I wondered if this was an oversight on their part or whether they are damaged (a couple of the images show signs that the film has been repaired). 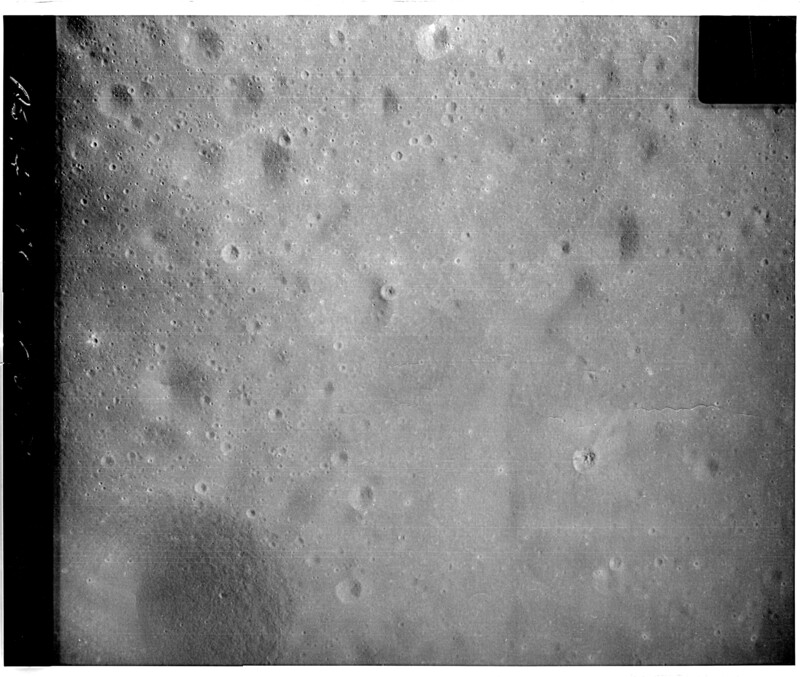 I hope to start writing this up soon with a view to comparing the detail in the images (particularly the very high resolution scans apollo16uvc obtained of actual photographs) with other orbital images. obm, I have a question concerning these CSM images. Since all the missions except 17 are all pretty much around the equator. o any of the images overlap from mission to mission? Or are the strips too narrow to overlap? Apart from Apollo 14 itself (where Magazine Q covered the same orbital parameters), Apollo 12 (magazine T and some parts of magazines S, U and CC) and 16 (parts of magazines PP SS and OO) have the best overlap. Apollo 16's metric and panoramic cameras cover it well, but the quality is not as good as the best Hycon ones. If you download my kmz files for google earth you'll get an idea of the overlap, and how small an area the images cover. Most of the 70mm Hasselblad images from orbit that look straight down cover an area about 75km*75km, compared with just over 5km*5km for the Hycon. 03 17 08 l0 CMP Hey, I'm getting a great look at my low-altitude landmarks, Gordon, from this low pass here. 03 17 08 16 CC Roger, Stu. 03 17 08 28 LMP Gordon, I can't even attempt to describe this, we're passing over it so rapidly. There's so much here to talk about. 03 15 07 15 CC In about 4 minutes, you'll be at your minimum altitude, which should be about 40,000 feet above the terrain. We're wondering how things look down there. of fact - below some of the peaks on the horizon, although that's only an illusion. Paul and I did not sit still, here a taste of the research done on the photos. Paul has been able to find the location for every AS14-80 and AS14-79 photo. Let's compare AS14-80-10441 with the other sources over the years. 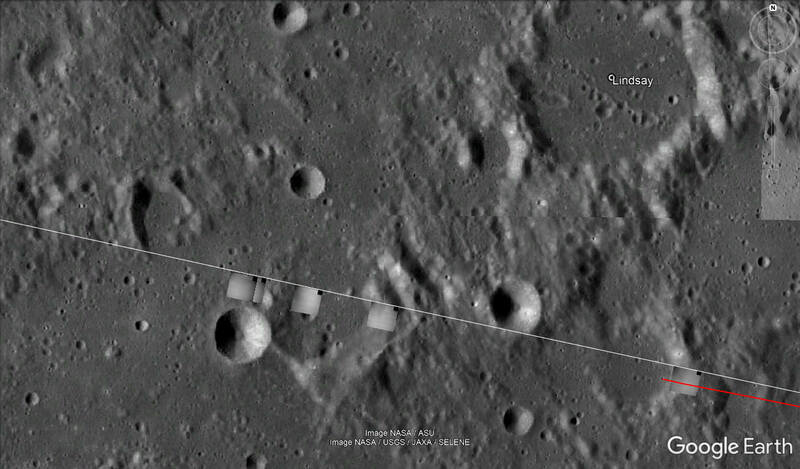 It can be seen that the large-scale photography of the Apollo missions is very competitive against modern probes, even against the LRO. And what about the AS14-79 photos? Although the magazine did not work well, Rosa tried to photograph the Apollo 14 landing site during the landing. Did he succeed? The red arrow points to Cone Crater, the largest crater at the landing site. If the magazine had worked properly, Rosa might have photographed the LM shortly after landing, or perhaps even during the landing. Whether AS14-79 had enough resolution for that, I'm not sure. The photos were taken in a higher orbit than AS14-80. All of Paul's research can be found on his marvelous website!